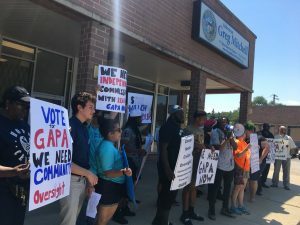 IMAN is at the forefront of two impactful pieces of legislation aimed at reforming both police accountability measures in Chicago and criminal justice policy across Illinois. Organizers and leaders have continued to push residents, partner organizations and legislators to take decisive action in each of these campaigns, which seek to create safer, more dignified communities throughout the state and enact a model that may be applied in other regions. The second piece of legislation in which IMAN organizers have been invested this year is SB 3489, the Path to Restoration Bill. After passing through the Illinois House and Senate, the bill remains on Governor Bruce Rauner’s desk, waiting to be signed into law. This legislation, drafted by IMAN organizers, would secure valuable rights for returning citizens across the state hoping to positively contribute to their communities. Most notably, individuals listed on Illinois’ cumbersome Child Murder and Violent Youth Offender Registry–many of whom were themselves young people when convicted of their crimes–would be able to amend inaccurate information about themselves. If you are interested in advocating for criminal justice reform, or participating in community conversations with other leaders, legislators, residents and others directly impacted by violent crimes, contact Organizer Nasir Blackwell, nasir@imancentral.org and Staff Attorney Aaron Siebert-Llera, siebert-llera@imancentral.org. IMAN continues to #FightFearBuildPower with several critical initiatives related to our Food Ecosystem work. 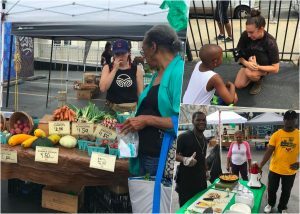 Organizers and leaders have called on communities to “fight back with food” through our Corner Store Campaign, Fresh Beats and Eats Farmers Market and Backyard Garden. Food plays a critical role in our collective health and wellness, and IMAN is doubling down on both its support of existing food providers, as well as opening up additional outlets for residents to access nutritious goods. Following a successful Refresh the Hood series during Ramadan, Corner Store Campaign organizers and leaders have advanced their outreach into new stores while deepening relationships with those already in IMAN’s network. Fresh Beats & Eats Farmers Market returned in July, opening up a weekly space for residents to enjoy locally grown, organic produce, inspiring artistic expression and relaxing gatherings with their neighbors for the fourth consecutive year. Led by new Food Ecosystems Coordinator Eric Rodriguez, the market has added new features like a petting zoo and regular giveaways of groceries and personal care products. Fresh Beats & Eats will run through October 27, rain or shine. Tucked in the back of one of IMAN’s properties, the Backyard Garden is flourishing. Managed by longtime leader Olisaemeka Okakpu, the garden has served as an outdoor classroom and source of fresh produce for other Food Ecosystems leaders interested in the art of urban farming. Several harvests from the garden have been delivered to the Fresh Beats & Eats Farmers Market to be distributed as samples. 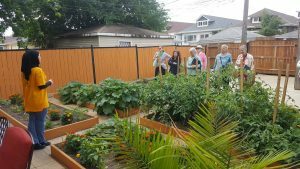 A local chef also conducted a live cooking demonstration with vegetables grown in the Backyard Garden, showing market-goers that they too can own their food “from seed to plate”. There are many ways to support IMAN’s Food Ecosystems work, like purchasing local foods from Fresh Beats & Eats Farmers Market, or engaging one of our partner corner stores. To get involved as an organizer or leader, contact Corner Store Campaign Manager Sara Hamdan or Food Ecosystems Coordinator Eric Rodriguez. 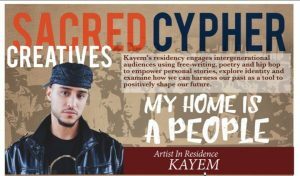 IMAN recently hosted another weeklong Sacred Cypher Creative artist residency, this time featuring Chicago-based hip-hop artist, Kayem. This was the third residency of 2018, and the first held in Atlanta. Kayem’s work is rooted in his identity, being a child of the Libyan diaspora. His residency, entitled “My Home is a People”, collaborated with IMAN’s Green ReEntry program on a series of events and workshops using free-writing, poetry and hip-hop to empower personal stories and help communities harness their pasts as a tool to positively shape the future. The residency began with Kayem facilitating a “Writes of Passage” writing workshop at Atlanta’s Greening Youth organization in collaboration with Urban Youth Corps. Kayem’s vulnerability encouraged attendees to open up and heal by writing out their personal stories. Later that week, Kayem led “Recalibrating our Spirit”, during which newly hired Atlanta Green ReEntry cohort members bonded through mutual storytelling. He also hosted an intergenerational town hall meeting called “Bridging Boundaries” on Independence Day, which gathered a diverse group of local leaders to discuss ways to create bridges in communities that remain deeply divided. 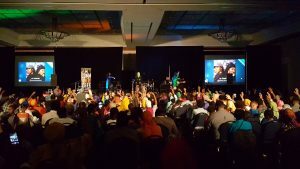 Kayem was invited to present his work at the 2018 Community Life Forward (CLF) conference, where he appeared at “Taqwa Talks” and spoke on the Social Justice panel. His residency concluded with CommUNITY Café: Revitalize and Remix. 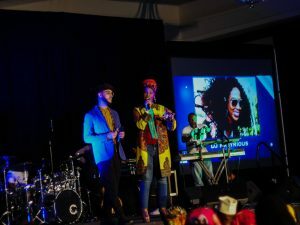 Over 400 CLF conference attendees, community members, friends, families and supporters convened for an inspirational live performance experience designed to connect, inspire and organize diverse communities to action. During the event’s “Café Hour”, audiences were invited to engage IMAN’s ongoing community wellness work, support local businesses and artisans inside CLF’s marketplace, snack on delicious appetizers, and enjoy an interactive performance led by Surabhi Ensemble. Kayem emceed the Café alongside Authentic Aseelah, and with sounds provided by ATL’s very own DJ Rasyrious. In addition to Kayem, the night’s extraordinary artist lineup included: Brother Ali and Al Taw’am, Tammy McCann, Mama Sol and a global music fusion collaboration featuring members of the Surabhi Ensemble (Ronnie Malley, Carlo Basile, Massamba Diop). Stay tuned for IMAN’s next artist residency in October, featuring Chicago hip-hop artist PHENOM. If you are interested in getting more intimately involved with IMAN’s arts work, please email arts@imancentral.org.